Warcraft III: Reign of Chaos is one of the highest rated real time strategy games ever and was released in 2002 by Blizzard Entertainment. 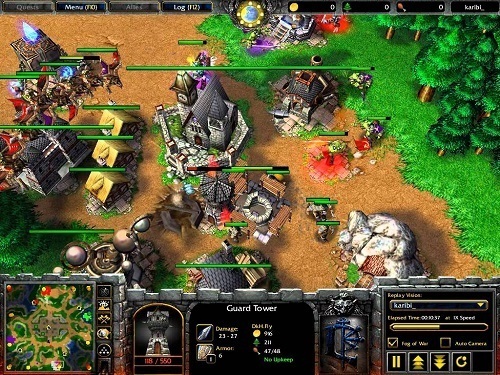 The game also includes an expansion (Warcraft III: The Frozen Throne) which adds even more gameplay and features. Warcraft III lets players use one of four races (each with their own campaign). These races include humans, orcs, undead and the night elves. Gameplay takes place across a number of locations making the game feel very realistic as you follow the storyline across an entire game world. Gameplay is very similar to most games in the RTS genre with players collecting resources, building up their settlement and training their troops. The game also adds some unique elements though including the ability to control hero characters that you can equip with items during your campaign adventure. These heroes will also level up and gain strength, with every level you can place a point in the heroes available skills to create your hero the way you want. Warcraft III also has creatures spread across the map that are hostile to all players, these creatures generally guard areas and can be killed for experience, gold and items. The game simplifies resource gathering into two resources (gold and lumber) with players chopping down trees and mining the available gold mines for resources. A third resource (food) is also in the game but simple restricts the number of units that players can build. After playing Warcraft III it’s easy to see why it’s both a fan and critic favourite. The use of story elements and RPG like features sets it well above most other games in the genre. The original game (Reign of Chaos) has a crazy amount of content in itself and when combined with The Frozen Throne expansion you get countless hours of gameplay for a great price. 4 unique races to play (each with their own campaign). One of the all-time highest rated RTS games. Varied environments to create a realistic story focused environment. RPG like hero system lets you create the hero you want to help you in battle. Just awesome.play it and b wowed.advanced age of empires..